I always marvel (and rejoice!) when I see intricate needlework projects successfully completed by stitchers who are beginners in that technique. When this happens, it illustrates the point that, with a little courage and determination, any kind of needlework is accessible! It just depends on how badly you want to do it. Case in point: Cathy Pratt. She’s a geologist by day, and obviously pretty keen about needlework when she’s not geologizing! 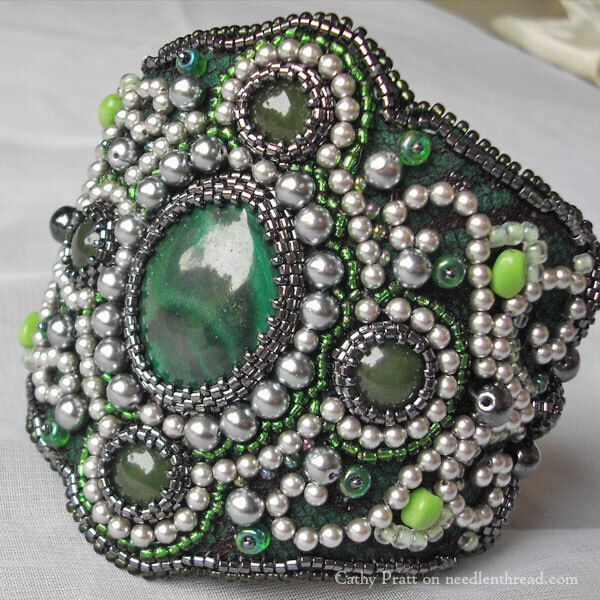 I just recently finished up a project from Inspirations magazine issue 85: the instant I saw the pictures of the gorgeous beaded cuff ‘Precious’ I knew I had to make one. I’d never done much embroidery with beads before, and certainly never with stone cabochons, but I knew I REALLY wanted to make such a beautiful piece of jewelry. As luck would have it, a local rock and mineral club was holding their annual gem show not a week after the magazine arrived, and I had a perfect opportunity to get the stones I would need. The instructions in the magazine were very easy to follow, even for a first time bead embroiderer like me, and my bracelet turned out wonderfully. Thank you so much for introducing me to such a great magazine. 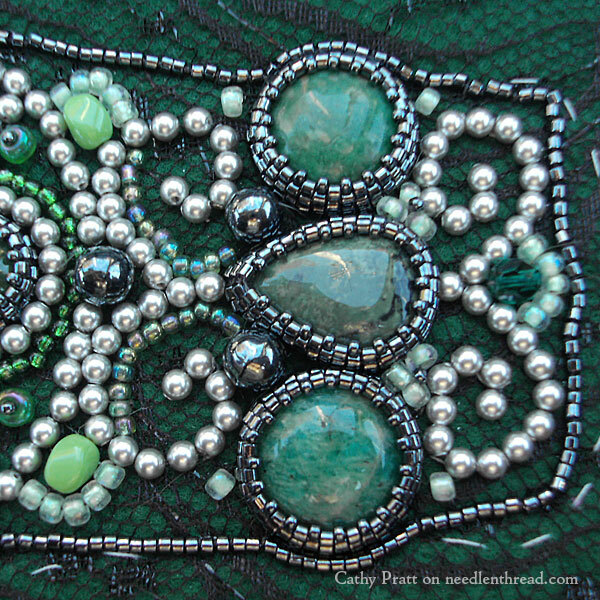 What a fantastic outcome for a first project with this type of bead embroidery! My current project was a long time in starting since I didn’t know quite how I wanted to go about it at first. 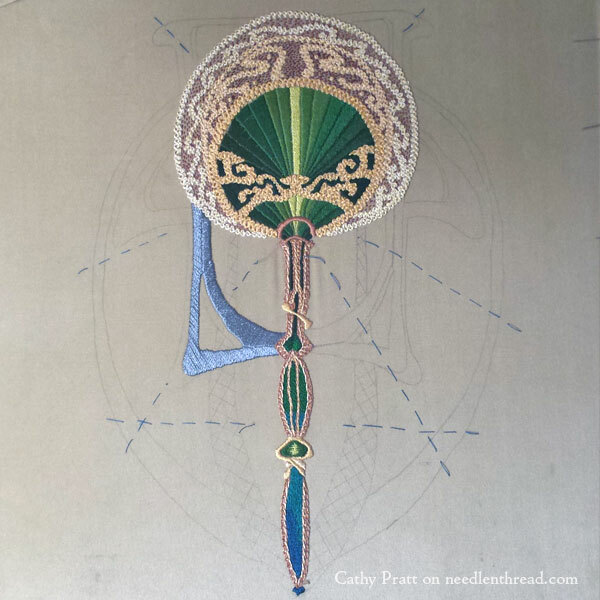 I was reading your ongoing articles about silk and goldwork projects, and knew I wanted to make something special to frame in my house, but wasn’t sure where to start. I had a piece of silk fabric I bought for a song at an antique store that I planned to use for the ground, but I didn’t really know where to go from there. Then I read your articles on threads from The Silk Mill, and decided to give them a try. 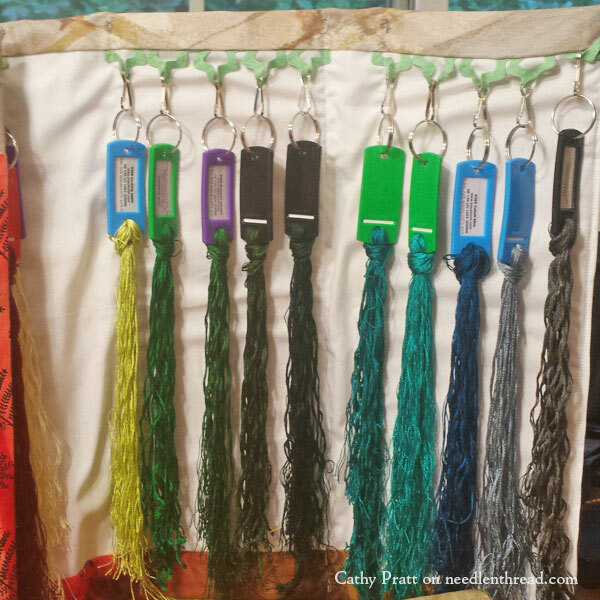 Of course, being a geologist, I had to buy the thread color pack named “Precious Minerals.” Your advice about gently steaming the threads to calm the boingyness worked perfectly, as did the key tabs to keep the cut lengths organized and labeled. So I had my materials, and I tweaked a pattern from the internet into something I really liked, but I still wasn’t quite ready to begin. I’ve only ever done embroidery in hand or in a hoop, but I wasn’t sure that was the way to go for the silk fabric and threads. My design was big enough to make me think I should try out some sort of frame instead. Then I read your review of the Millenium frame, and promptly ordered my own. I absolutely love it, it is so easy to set up, and keeps perfect tension. I am so glad I splurged on it rather than trying to keep my slippery silk taut in a hoop. My silk fabric was originally ivory colored, but I decided that was too bright to go with the darker greens and blues of the threads. I had been experimenting with dying fabrics with various plants from the grocery and my backyard for other projects, and turned the ivory silk to a lovely shade of olive green with mint leaves. Lots of other little tips and tricks from your website have made their way into this project as well. Whenever I have a bit of trouble with a stitch, I just pull up your blog and find all kinds of advice to make it perfect. I have really enjoyed working with the silk threads, and trying out new stitches and combinations. I keep working on this piece whenever I have a spare half an hour to work a thread or two. It has become something of a ‘carrot’ project for me, as I only let myself work on it when other chores are done. Glorious job, Cathy – fantastic satin stitching! And a lovely use of braid stitch (I think?) for the filigree. I hope we get to see photos of the finished project – now, go do your chores and get stitching! Hi Cathy a lovely piece of beaded bracelet embroidery especially for a first time embroider, I love the colours of the stones and the beads you chose for this project they really blend in well and your follow up project looks lovely as well. Yes I agree Mary’s Needle n’ Thread is a great resource when starting any project with great tips and techniques you can’t go wrong. Good luck with the silk project. Thanks Mary for sharing Cathy’s projects with us great inspiration. Wow, Cathy! You are a natural. Both projects are beautifully done. This was a wonderful inspirational post. I have been thinking of trying bead embroidery, even purchased some beads at a garage sale earlier this summer. Your articles, tutorials and links are all excellent places to start when trying out something new. Cathy did a fabulous job with both of her projects. Thank you for sharing everything that you do. Have a wonderful creative day! Cathy! Hard to think of you as a “beginner”!! Great work. And a great testament to Mary’s great sight! It’s all GREAT!! 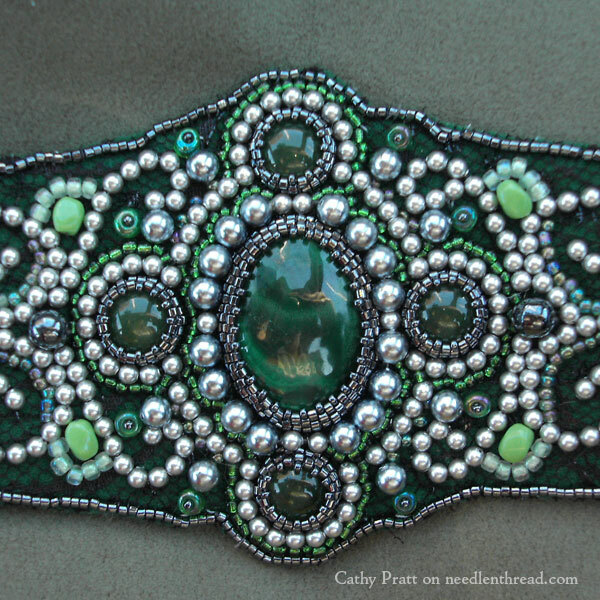 Thank you for showcasing Cathy Pratt’s two gorgeous projects. I must say, (I cannot help myself) she likes to go for Baroque. Oops, should have read…How marvelous! Wonderful work – thanks for sharing. What did she embroidry on? What type of material? Previous Previous post: Come, Travel with Me!